(Nanowerk Spotlight) Electronic devices with muscles-like stretchability have long been pursued, but not achieved due to the requirement that all materials in the devices – electrodes, semiconductor, and dielectric – are stretchable. In their pursuit of fully flexible and stretchable electronic devices, researchers have already reported stretchable solar cells and transistors as well as stretchable active-matrix displays. The nanomaterials used for these purposes range from coiled nanowires to graphene ("Foaming for stretchable electronics"). Recently, researchers at UCLA have successfully demonstrated a stretchable polymer composite that is highly transparent and highly conductive, and applied this nanocomposite material to fabricating stretchable devices. "Our recent work represents a proof-of-concept, highly stretchable semiconductor device wherein every part of the device is intrinsically stretchable," Qibing Pei, a professor at UCLA's Department of Materials Science and Engineering, tells Nanowerk. Reporting their work in the July 28, 2011 edition of Advanced Materials ("Intrinsically Stretchable Polymer Light-Emitting Devices Using Carbon Nanotube-Polymer Composite Electrodes"), Pei's team developed a technique to fabricate transparent single-walled carbon nanotube (SWCNT)-polymer composite electrodes. In a relatively simple fabrication process, the researchers prepared their stretchable electrodes by putting porous SWCNT films on glass substrates and then coating them with a liquid monomer (tert-Butyl acrylate – PtBA), which penetrated into the nanoporous network of SWCNT and filled the pores in the SWCNT layers. This coating was then polymerized under UV light and the entire film could be peeled off the glass substrate. "After peeling off the glass substrate, the nanotubes that were originally on the bottom, in direct contact with the glass substrate, were then exposed on the surface of the PtBA film; they provided the necessary electrical contact to form a composite electrode" explains Zhibin Yu, UCLA postdoctoral fellow in Pei's group and first author of the paper. "The infusion of PtBA into the SWCNT film preserved the original SWCNT network and its high conductivity. The composite electrode exhibited a sheet resistance comparable to the original SWCNT coating on glass substrate." He notes that the interpenetrating networks of SWCNT and the polymer matrix in the surface layer of the composites lead to low sheet resistance, high transparency, high compliance, and low surface roughness. The composite electrodes can be reversibly stretched by up to 50% strain with little change in sheet resistance. Demonstrating the practical use of their nanotube-polymer composite electrodes, the team went on to fabricate light-emitting electrochemical cells by laminating a luminescent polymer layer between two of the SWCNT-polymer electrodes. 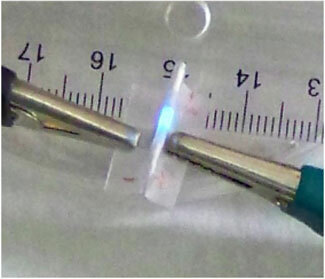 Submitting this light-emitting device to a stretching test, the researchers found that they can be deformed by up to 45% linear strain without damaging the electroluminescent properties. Pei says that the next big challenge for his team is to design and synthesize a new polymer semiconductor that exhibits both rubbery elasticity and unaltered electrical property at large strains.